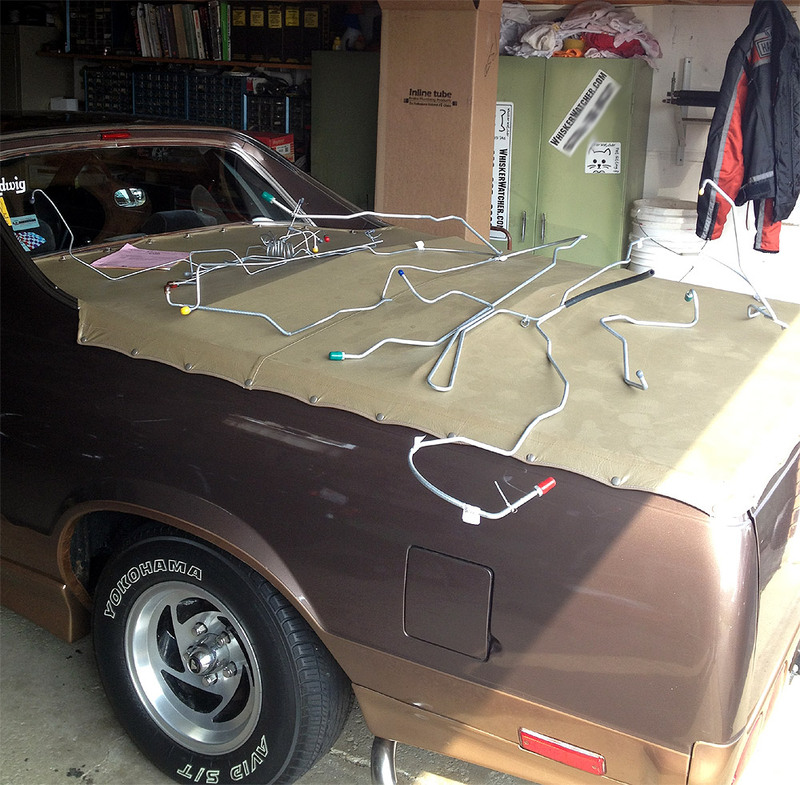 This page shows the latest upgrades to the El Camino. Jan 2012 to Jan 2013. 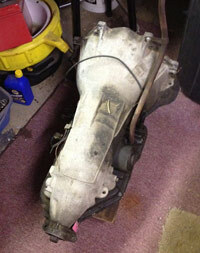 Projects 2012 - 2013 (This page) New Overdrive Transmission. 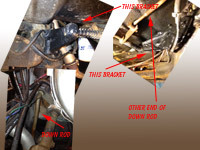 Human subframe connectors. This year will hopefully see a lot more driving, and car shows. Overdrive is the first order of business. February 6th of this year I had to get modifications to my spine again. This time in the neck. I was losing the use of my hands and legs, and my left hand was going numb. What we think was a football injury, just getting worse from getting so damn old.... caused me to have to get the "1957 JC sub frame connectors". 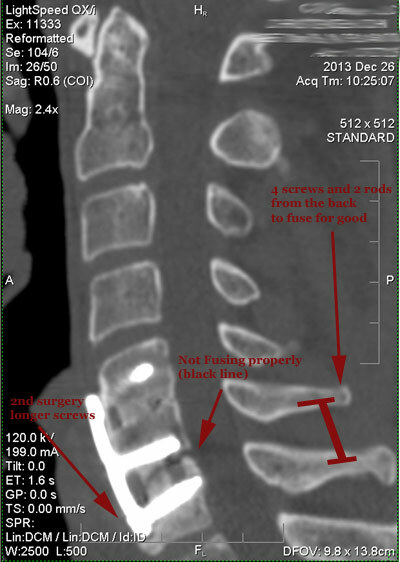 High Tech titanium plates and 6 screws now connect my bones together to keep them away from the spinal cord and the nerves. 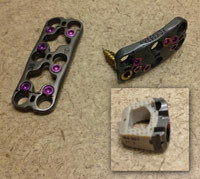 The inset is a polymer disc replacement that the bones will eventually grow to. Mine (I am told) does not have the metal on it. Mine is more like the one on the left. These are just examples the Doc showed me. Everything is healing fine. I should be back to work for part days in late February. Heavy auto work is months away. 2/18/12 - Purchased 200-4R Transmission to build and convert to overdrive. Craig's List, $50. Doesn't shift from 1st to second, was tested on a transmission Dyno, and that is as far as it went for that owner. I plan to find a good builder get it up to Grand National Spec. Do you know how to decode this number? Thanks for any info. 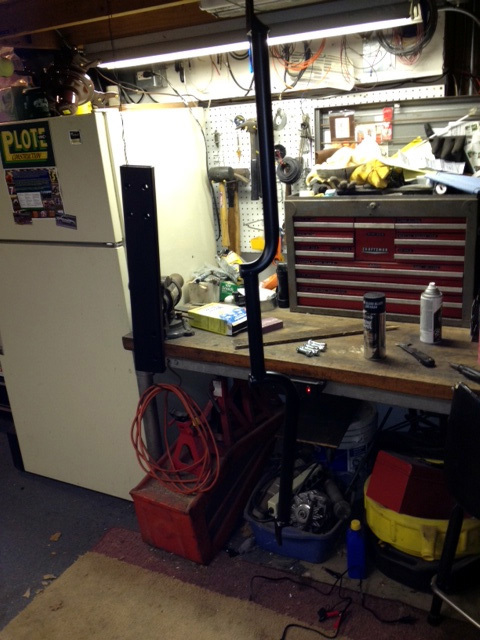 Here is the frame extension (hanging left) and the new Iceman Cross Member (hanging right). Both sanded, primed, and high heat engine paint, semi gloss black. 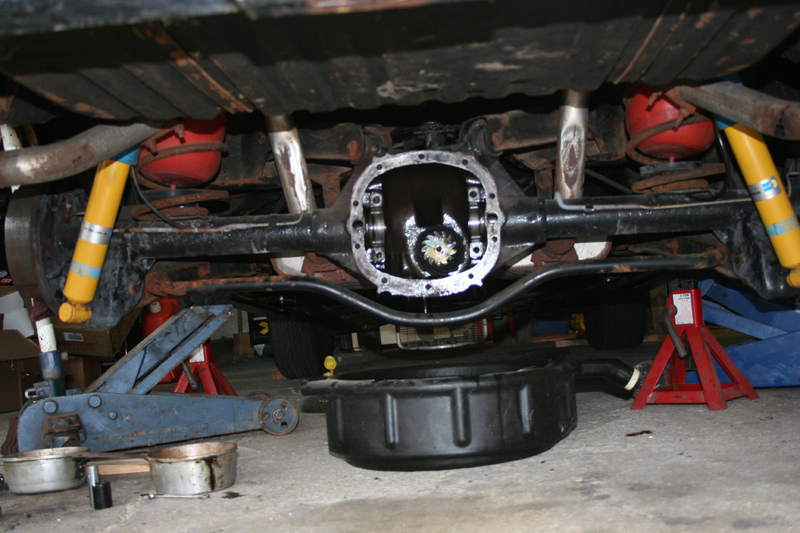 I would love nothing more than to put the rear upper and lower control arms from Iceman on the car too. 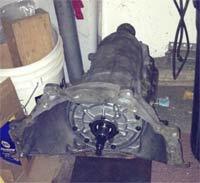 I picked up the transmission from the builder, Bill Schreiber in Aurora, IL, Transmissions, Etc. I have a new super servo in it, it does not have a shift kit, but it has a much larger band, and basically Grand National specifications. I don't know about working on the transmissions myself (hence, passing this job on to someone who knows what they are doing, and has 30 years of experience doing it), so I can't tell you the particulars. He gave me a 2 year guarantee. Total cost for the core and the rebuild was $660.00 Exceptional for what I got, I think. 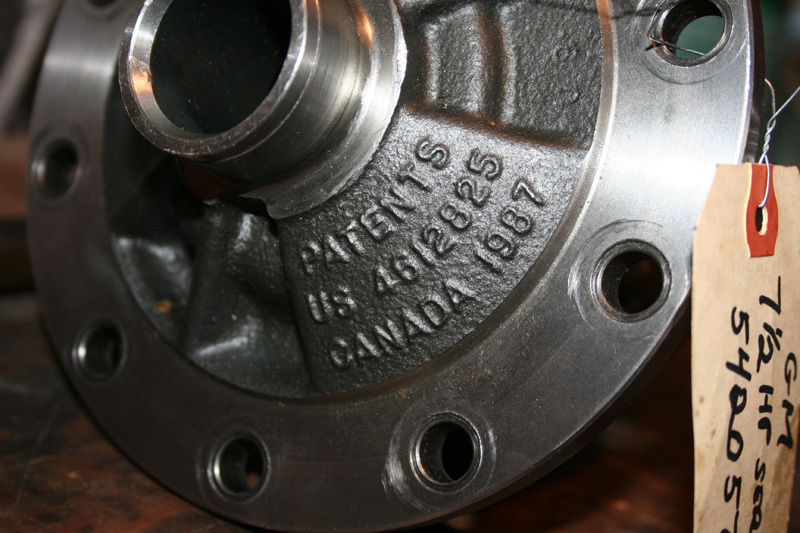 I am shopping for the right torque converter now. Just purchased an F-Body rear axle with a Posi for $50. It is reported to have 3.23 gears (same as what I have) and 26 spline axles. I want to take the posi unit from it and put it in the El Camino. I opened it up, and it was not a Posi. Lesson learned, I should have checked it out better on site. I was physically unable to root around too much though. And I wanted them to just get it in the Elky at that price. Looks to be an open 2.5x differential. He was a real nice kid, and threw in these Aluminum drums for the rear. I have yet to check to see if they can be turned. The last 2 sets of these that I had were not within spec. Nope .... Just like the others I have bought. Warped and turned before to within 1 mm of spec. Good idea for the short term, but that's why these aren't available any more on the aftermarket I suppose. 4/1/12 Purchased a Posi unit on ebay for $199. I have 3.23 gears in the Elky now, and this will go right in. 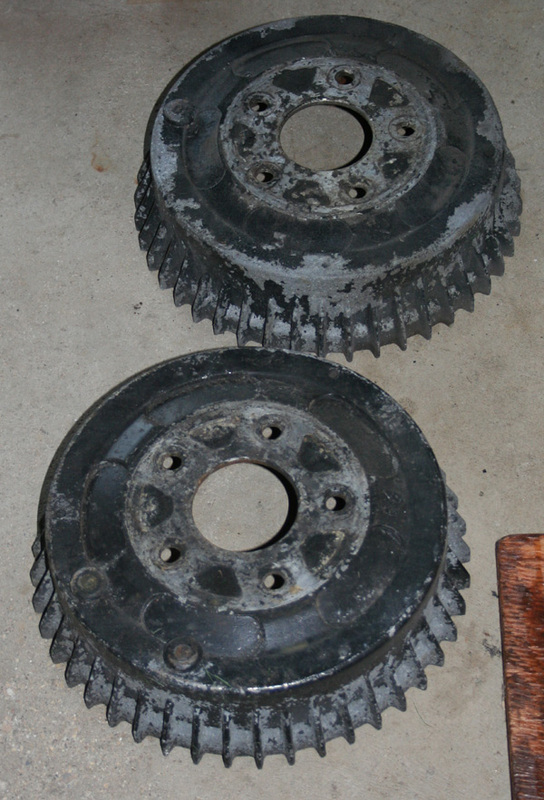 Ring Gear Diameter: 7.5" & 7.625"
The car goes in to Ron's Automotive to get the work done in the morning. 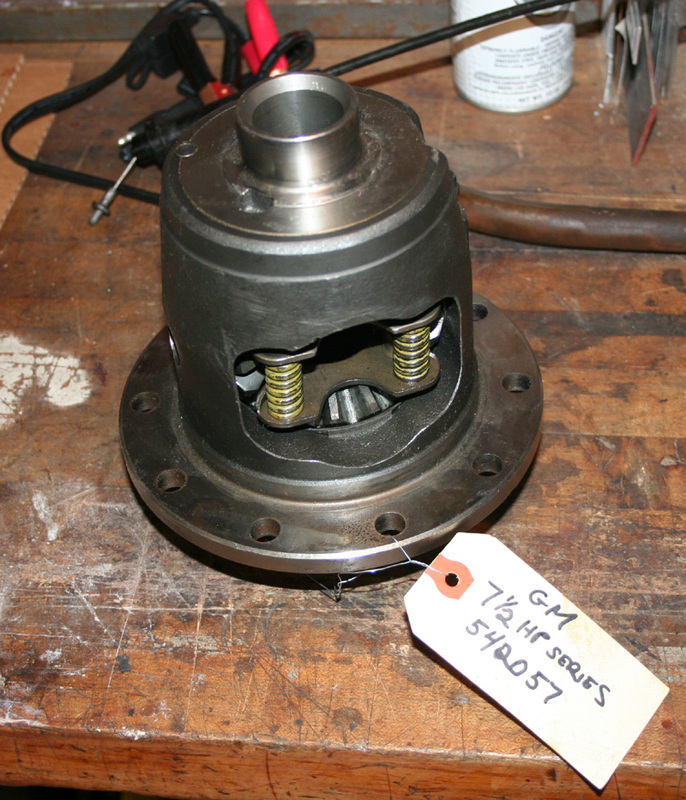 I bought a 1650 Stall (medium) torque converter from Auto Zone for $50 exchange. This was the part number for a Grand National, 1987 with the 200-4R. They had low and high stall too. The core charge was $150. Good thing I had the core from the trans I bought. 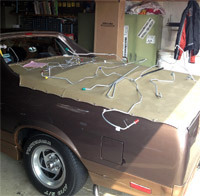 Got the car back on Friday 4/20/12 all finished. This shot shows the cross member really well. 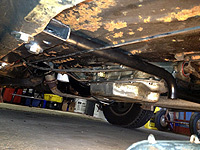 Lots of room for exhaust there now. Plenty of room for both pipes just on the passenger side. This shows the frame extension well on the left of the picture. Also shows plenty of rust. You can see that they even painted the bracket for the pivot on the shifter rod. They had to weld it to get it to line up properly. The only mod to get the shift cable supplied to work properly was a split shot on the cable. Not bad, considering this is the main control for the transmission. There could have been a lot more problems with geometry on this. The speedometer reads 45 at about 25 or 30 mph. 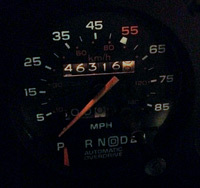 So I will have to be changing a gear to keep the lockup from kicking in too soon, and so the speedometer reads better. No gears available any more. Will have to go another direction. 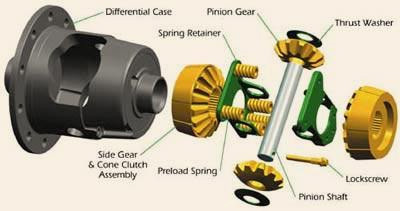 This is the speedometer Reducer gear. I followed Nate and he told me when I was going 40, 50, and 60. It was 45, 58, and about 70 on my dash. 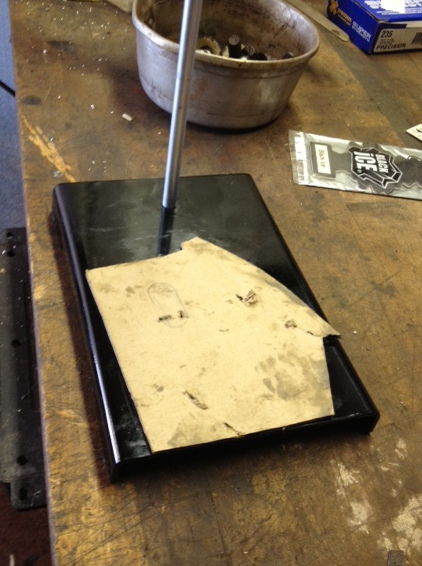 This worked out to about a 14% high reading according to Kerry at PATC where I ordered the reducer. It wasn't an off the shelf converter, so it had to be special ordered. Took about a month, because the company that made the cases just folded up, and they had to scramble to find another company. It didn't work when I first got it. It locked up. Not wanting to fiddle with it, and after I paid $80, I sent it back. It arrived again on the 30th of June, and it was installed an working on the 1st of July, 2012. 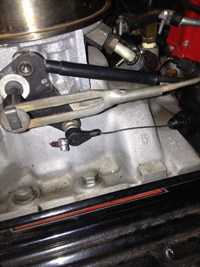 I have been going rounds with the power steering pump. It was leaking, but, as with just about everything on this car, I have to figure out what the donor pump was to get a replacement. Tried 89 Firebird, then g-body Oldsmobile, with no luck. I think I have it narrowed down, using the casting number on the serpentine unit, to 1992-1993 Caprice part. I'll let you know on Tuesday 5/8/12 if it fit. A OK with no leaks. it is a 1993 Caprice Serpentine system. 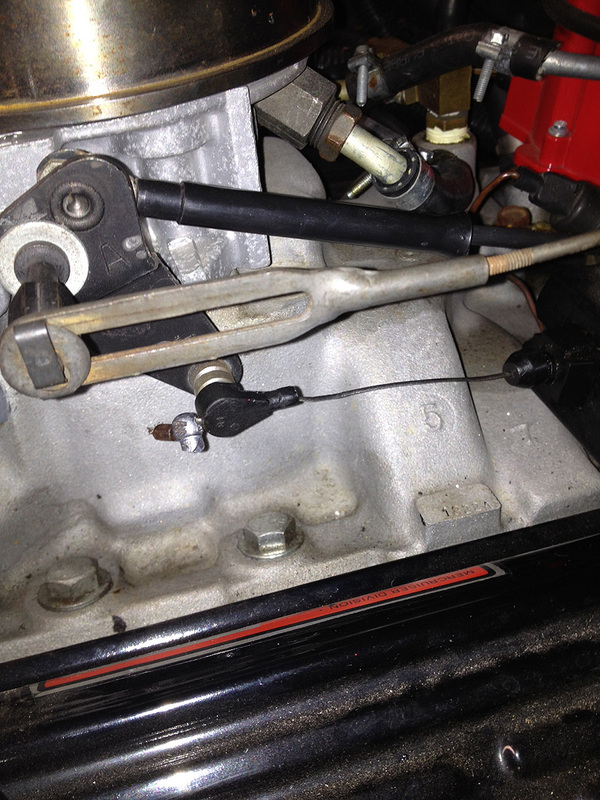 Here is the frame bracket and the down rod I am looking for. I had a 350C transmission before, and now the 200-4R. 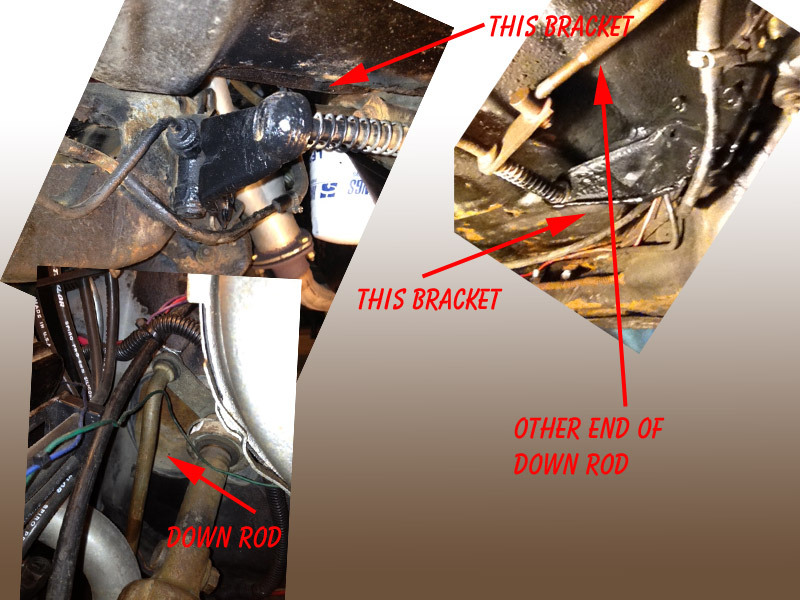 The down rod is different, but because the pivot bracket has been modified, even the right rod won't work without replacing the bracket. So I need to get both from a 1987-1990 G-body with 200-4R or same years 85-90 B Body car with a 200 or 700. 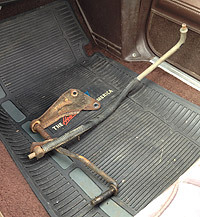 I picked up this linkage for $30 from a 1987 Olds Cutlass 442 parts car through Craig's List. It was about a 2.5 hour drive up and back and breakfast at the McDonalds I met him at. The Elky used less than a quarter of a tank. 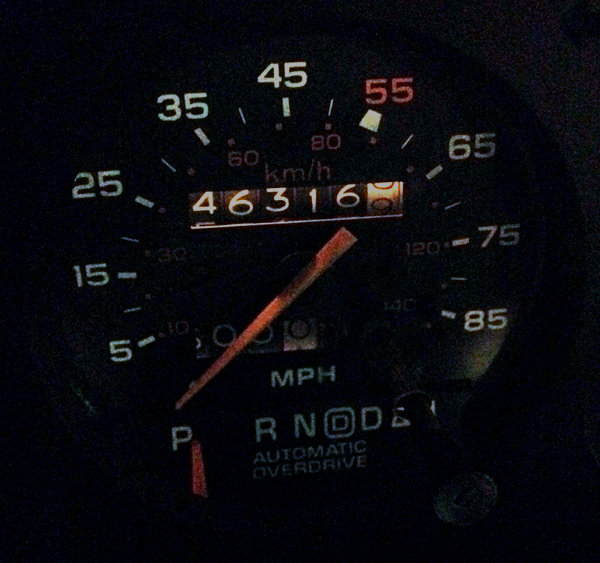 It's getting great mileage with the overdrive. This is the 2 linkages together. 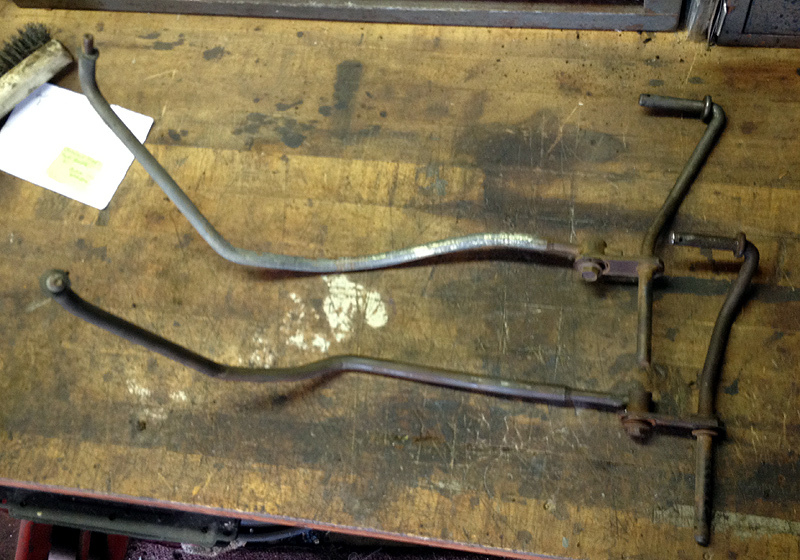 The 200-4R linkage is on the top, and 350C linkage on the bottom in this picture. The 200-4R upper rod is longer, and is routed more toward the outside of the car than the 350C version. 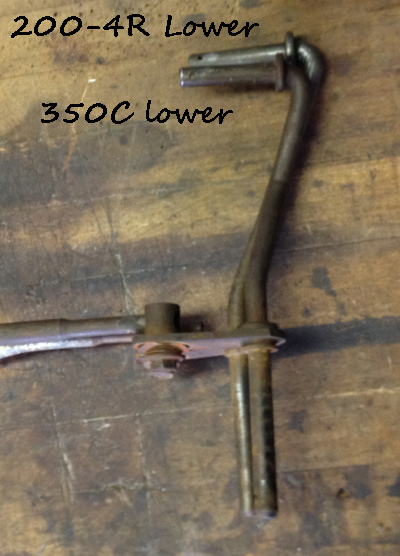 The lower section is shorter on the 350C and bent differently as well. This is the frame pivot bracket that looks identical. 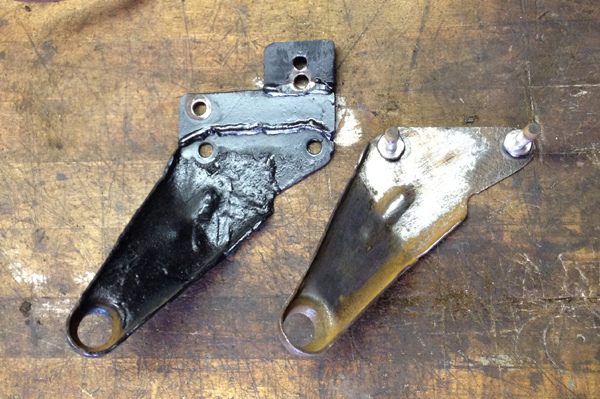 The one on the left was modified by my installers to get it to work with the 350C rod on the 200-4R transmission. 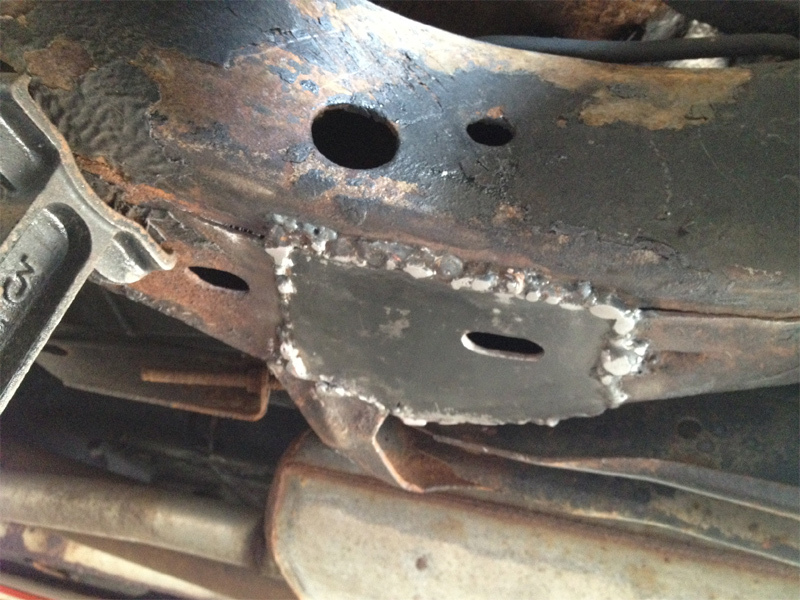 I probably could have cut what they added, but they told me that they cut it, and welded on it. Being unable to physically get under the car and check it out (after the last surgery) I just looked for a stock bracket. I painted this one up and installed everything with new cotter pins. It works great and I can see what gear I am in across the board now. 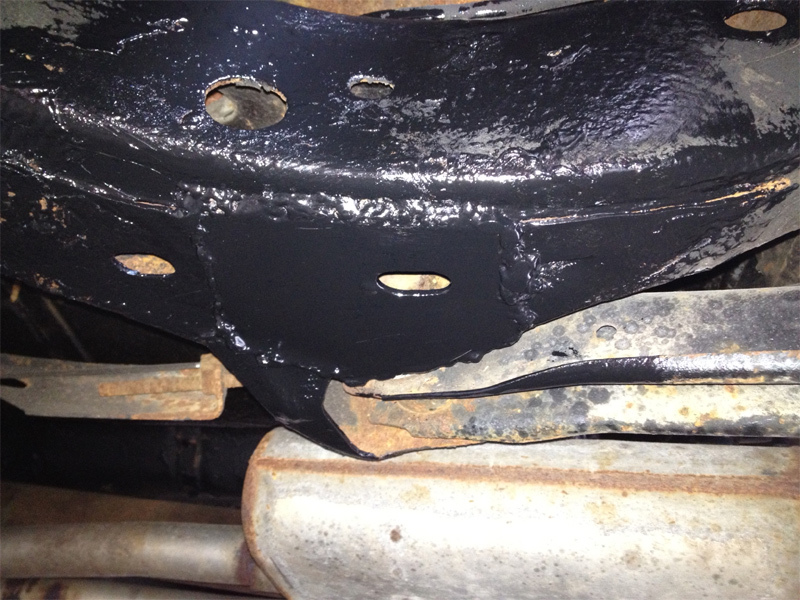 Time to fix a hole in the rusty frame right next to the lower control arm attachment point, on the driver's side. 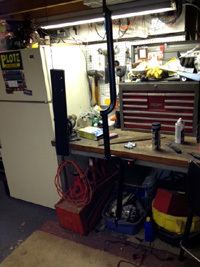 This is at a great place to use to either jack the car up, or put a jack stand there. Too bad it's a hole! I cut the bad piece out and made a cardboard tempplate. 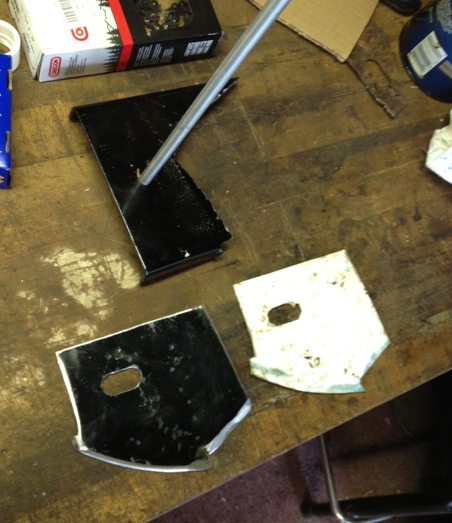 The hardware store only had 1/8" strips of welding sheet that were too thick, and too narrow to get this job done. I bought it, but returned it for the $18 or so. I ended up at Science and Surplus, and bought a test tube/burner stand for $14. The metal on the bottom of the piece was perfect. Even painted. . 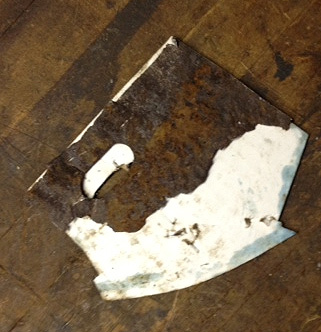 This is after I cut out my metal and did some shaping, and grinding the edges to weld. 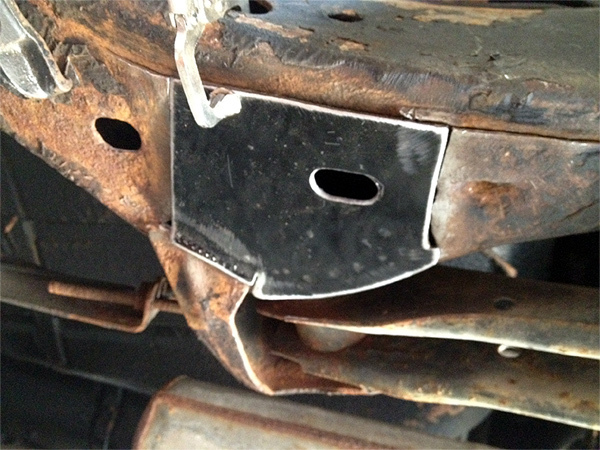 This is the piece clamped in place. After welding and a little grinding. I am still learning. I used the Mig with sheilding gas. It was about as high as it would go with the thin wire. 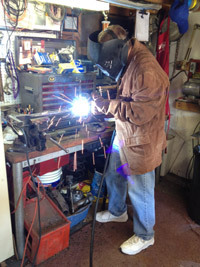 The last time I welded on the frame I used flux core wire, and no gas. This looks a lot cleaner, but took longer. I put some rustoleum on it just to cover all the bare metal. In a perfect world, I will get this thing up on a lift, and scrape all the undercoating off, treat the rust, and paint it. Robert Adams from the El Camino list came for another welcome visit to help the cripple get the posin installed. I wasn't entirely a supervisor, but Robert kept me in line, taking heavy work over when I started digging in. Thanks a ton!!!! This is the rear with the open carrier removed. 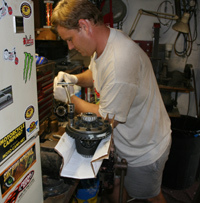 Robert Torquing down the ring gear on the 3.23 to the new posi carrier. Laying down the bead of Gear Oil Resistant Permatex RTV. We put some on the bolts too. All put together and ready for a test drive. It was awesome to be getting the power to the ground again. Burnouts were controlled and short lived. It hooks up way better. Everything worked great. On to the U-joints project. 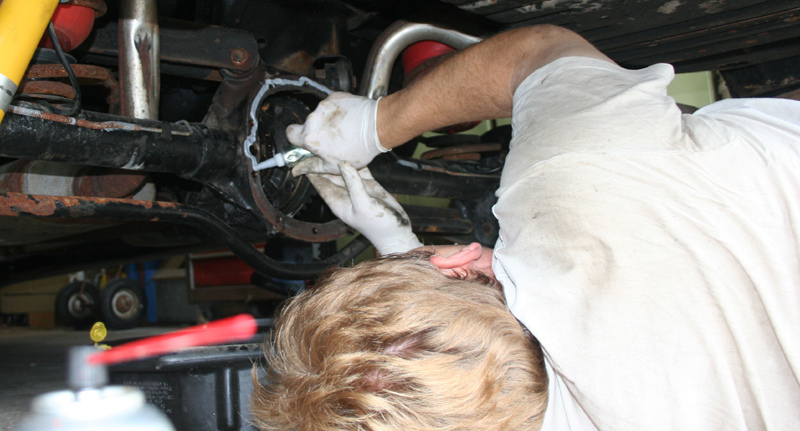 The u-joints were replaced with plenty of torching to get the original joints out. the loud "tink" sound I had on the 3-2 shift is gone. Success! 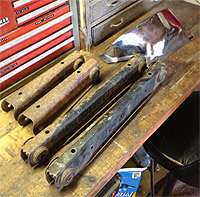 A set of upper and lower control arms from a Monte for $10. I will hold on to the uppers, but they are scrap. Mine are in better shape. I'll box the lowers, put new bushings in, and swap them painlessly when the time comes. Here is the first one with the 3/8" galvanized pipe cut and welded in place for the sway bar reinforcement. 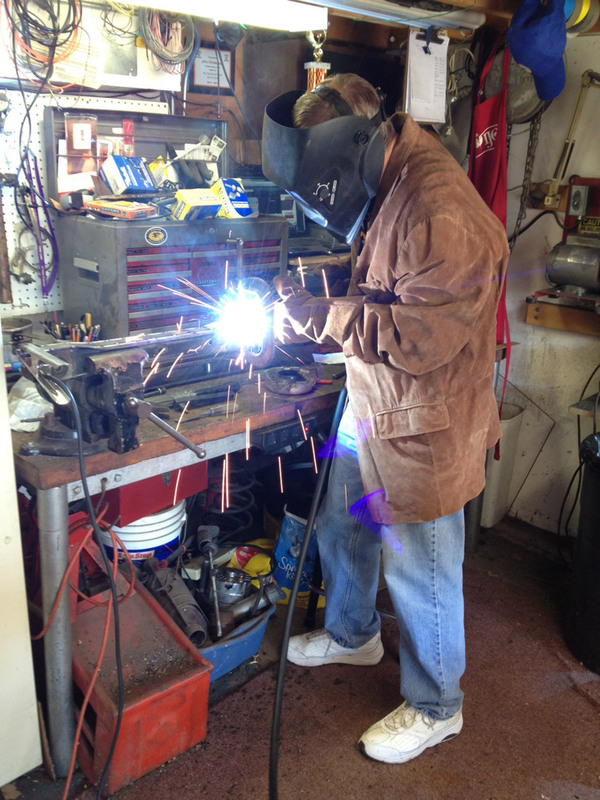 Here is the boxing of the first one ready to weld. 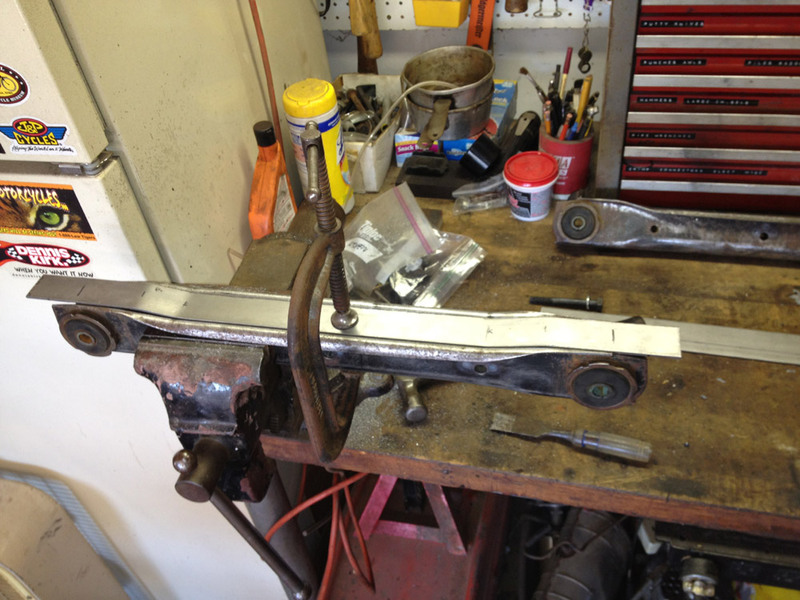 I used a 4' strip of 1/8" x 2" steel, cit it to 1 3/8 wide strips, 2' long. Then I bent and shaped the piece to fit, and ground it to sit flush where needed. I tacked it, about every 2 inches, and worked from the center. Then bent and cut the ends to curl around and slip inside. Then stitched and filled in the gaps so I wouldn't warp anything. Here is one angle of the first one finished. 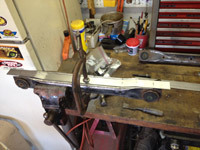 I have just started to grind on the welds on one end. Here is another angle. I have the other one started, but ran out of Argon gas ..... I think my regulator is foul. I am running out way too quick. More on that as I get on email with tech support at Eastwood. 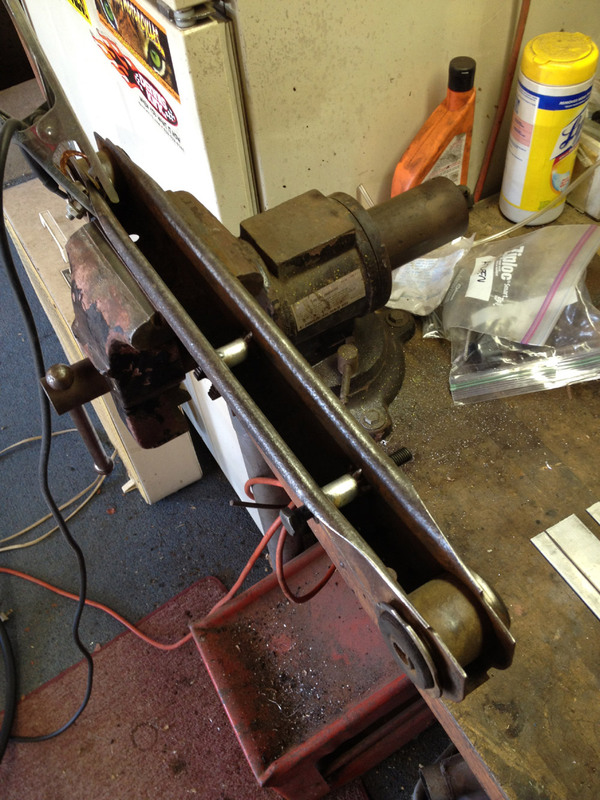 I pressed out the bushings on the first one, and will scrape, grind, and brush it to get ready for paint. The new bushings should press right in. These are the control arms all painted. 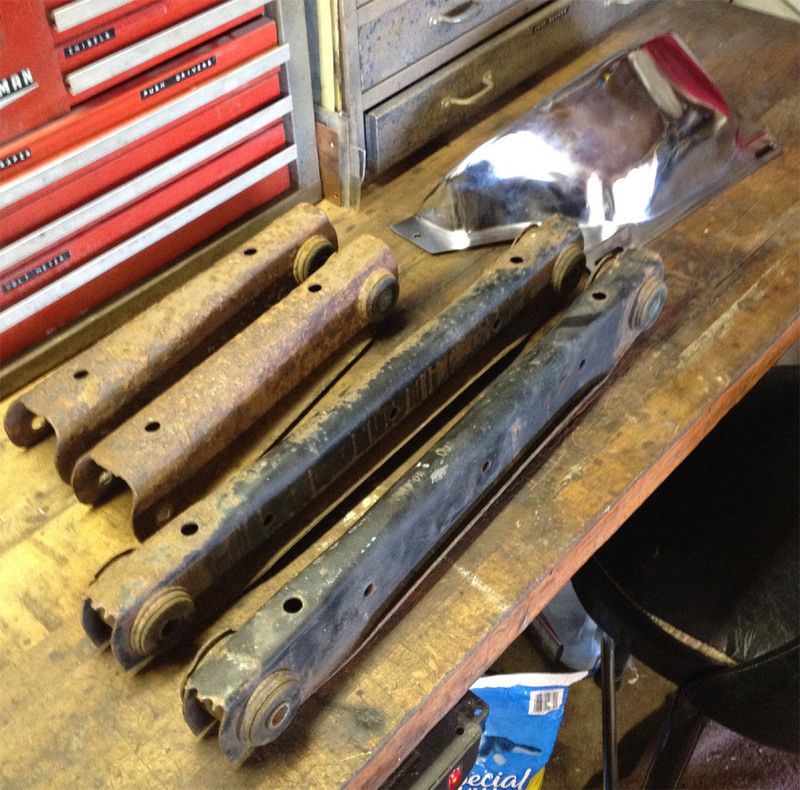 After they dry, I'll press the bushings in and they will be ready to go. 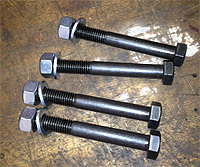 These are the new grade 10.9 bolts, washers, and Stover locking nuts. They are 12 mm 1.75 x 95 mm. There is no large view on these. 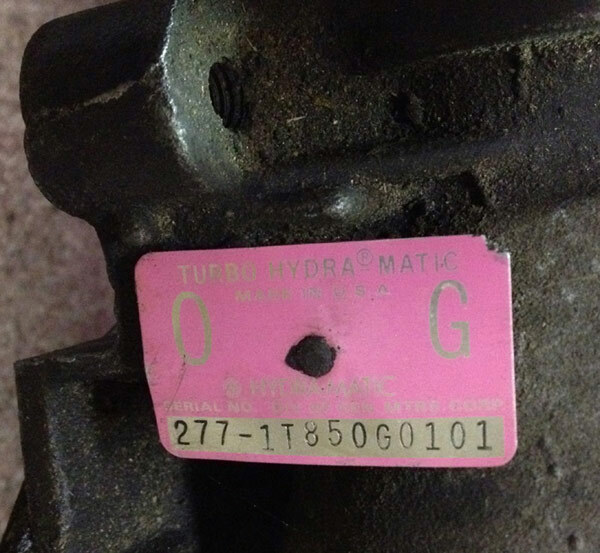 I got a couple extra too, for the upper control arm bolts on the differential that are old and not holding. $17.41 for all 6 sets. 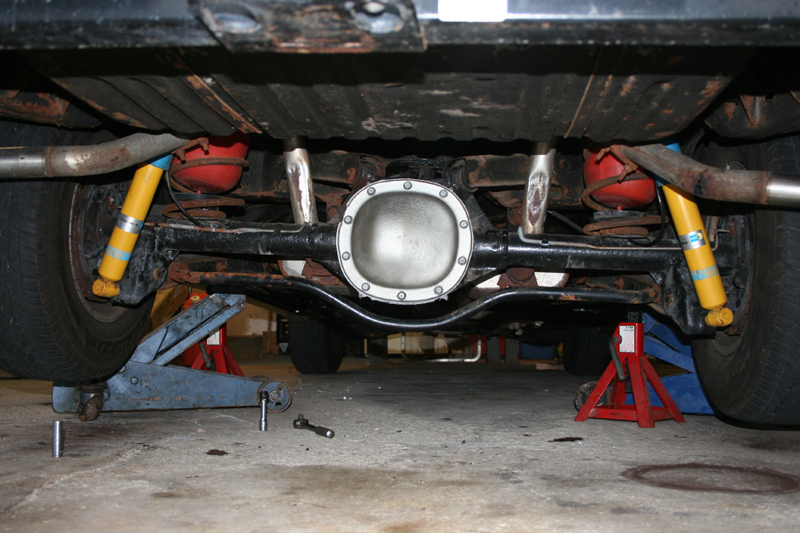 Thanks to the Saint Charles East High School Car Club for helping me get the control arms on the car on October 10th. I am still on a weight restriction (see the top of this page), and I could not have done this job without the help. 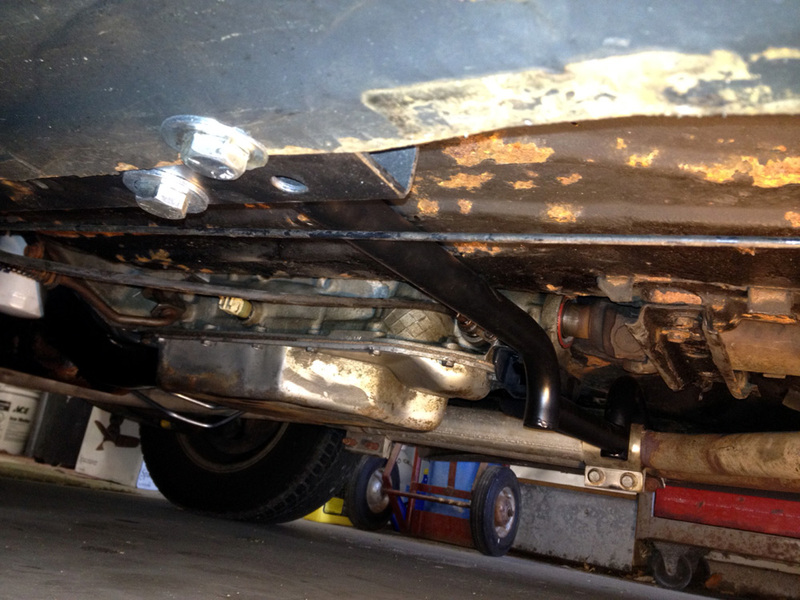 The Sway bar is now painted and back on. Nate helped me with that. I did get new grade 8 bolts and washers to put it on with. The others were pretty rough. The very first entry on this page, unfortunately, is going to match this one. The Subframe connector in my neck had a screw loose, and they had to go back in and replace the 2 at the bottom with larger, locking screws. So I am back to a 10 pound weight limit for 6 months, and rehab after a month. So much for working on the car the rest of the year. Recovery is almost complete, formal physical therapy is over. Still have a weight limit. Hope to get it somewhat lifted next month. Purchased some big brake parts from Mike H on the ELky List. They will get here when they get here. Police Caprice front spindles, 1LE Camaro Brake rotors and calipers, Global West tubular upper A Arms, boxed lower control arms, 1" lowering springs all around from Global West. 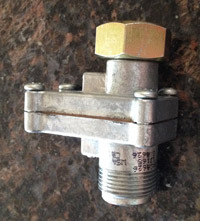 I bought a Caprice Master Cylinder, new in the box, Raybestos (39328). Pictured left are the new inline tube parts just arrived. All the brake lines, and fuel lines for fuel injection. I drove it the other day, and could smell gas. When it was up on the lift at the school, I found the source. It's a weeping fuel return line, that used to be a vapor line. No need to go down in flames after all this work! I Don't know when the change will happen, but I at least want to change out the leaking line ASAP. I changed the fuel line before the move, because I needed the use of the Elky to load up with hazardous materials that would not go in the PODS. June 2013 - We moved from Saint Charles, IL to Maple park, IL. The garage is about the same size, but no heat yet. We spent months settling in, and rehabbing this 100 year old house. The best thing is that I saved $1400/month on House Payments. I gave my Brother in Law the 1999 Pathfinder we have owned for years, and was a great vehicle. That means I need an economical commuting car. 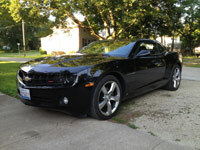 Enter the 2010 Camaro 2LT, getting almost 30 mpg. 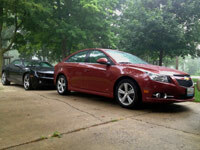 We got the wife a 2013 Chevy Cruze the same day. Happy 33rd Anniversary to us! 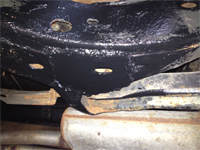 December 2013, the the 1957 JC subframe is not fusing as planned. I had to go in and get screws and rods in the back of my neck for C-6 to C7 in January 2014. This seems to be working as of 3/22/14 I have woken up with no pain at least a couple days, for the first time in 2 years. Waiting for about 6 months when I can lift more. It will be a year (Jan 2015) till the weight limit comes off.